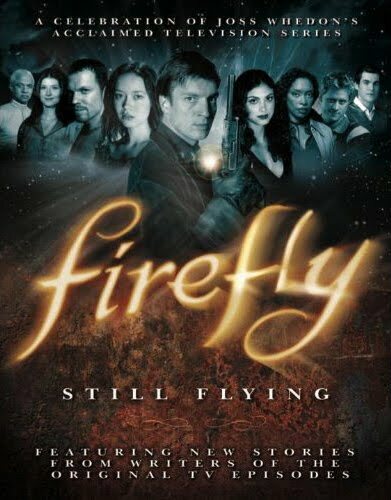 The Firefly anthology I mentioned a few months back now has a title: Firefly: Still Flying: A Celebration of Joss Whedon's Acclaimed TV Series. I have some good news and bad news though. The first piece of good news is it will be released in May so we don't have too long a wait. The second piece of good news is it looks as though only show writers will be contributing stories so everything should stay true to the rest of the series. The bad news is that the entire book will not just be stories, but a mix of photos, storyboards, and design art akin to the other books Titan has done for Firefly. I'm still a big enough fan that I'll be picking it up as soon as it is available. NEW STORIES. UNSEEN PHOTOS. SHINY! Since its short-lived appearance on TV in 2002, Joss Whedon’s Firefly has done the impossible. It’s sold over a half a million copies on DVD, spawned the hit movie Serenity, and most remarkably, inspired a loyal fan following — the Browncoats — whose numbers are still growing to this day. Still Flying is a brand new celebration of all aspects of the show, featuring a wealth of rare and previously unpublished images — including storyboards, production design art and candid behind the scenes photos — memories from the cast and crew, a tribute to the Browncoats, and, as a special bonus, EXCLUSIVE NEW STORIES BY WRITERS OF THE ORIGINAL TV EPISODES! NEWS | FUTURAMA is Returning!!!! Great series. I've got it (and Serenity) on DVD. I'll have to look into getting this book, too. There's going to be a Firefly anthology? Why is this the first I'm hearing of it. I am on board for this one. Loved, loved, loved that show. I only wish Joss would do some webisodes or another movie.